UNITED STATES. 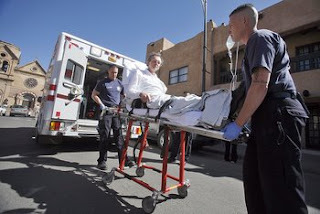 Rupert Sheldrake gives a graphic account of his stabbing (see our earlier story), the emergency treatment he received and the subsequent healing process that has taken place, via e-mail from Santa Fe on Wednesday, 9 April. A week ago, on the afternoon of Wednesday 2 April, I was giving a talk to several hundred people at the International Science and Consciousness Conference in the ballroom of the La Fonda Hotel, in the centre of Santa Fe, New Mexico. After the talk ended at 3pm, I stepped down from the podium and was talking to people in a small group that had gathered around me. Suddenly I felt a violent blow on my left thigh, as if I had been punched. It was totally unexpected, and I did not see my assailant run towards me. He was rapidly pulled away. I looked down at my leg and to my astonishment saw the handle of a dagger sticking out of my trousers. Without thinking, I pulled it out: the blade of the bloodstained weapon was about five inches long and an inch wide. I felt my trouser leg was wet with blood, and I pulled my trousers down. Every time my heart beat, a fountain of blood spurted from the wound in my thigh about four inches into the air. I was fortunate that several people from the audience with medical experience rapidly came to my assistance, including a nurse, doctor and paramedic. I lay down on the stage while they fastened a belt around my thigh as a tourniquet and pressed on my leg to reduce the flow of blood.